Why-Tech Wednesday: Flatev Can Make Fresh Tortillas Like Kuerig Makes Coffee, But It's Not Worth $199 | OhGizmo! By Randy Donack on 10/25/17 • Leave a comment! For this first installment of Why-Tech Wednesday, I want to go back a bit to last year, to the first product that has been stuck in my mind like a bad tumor. 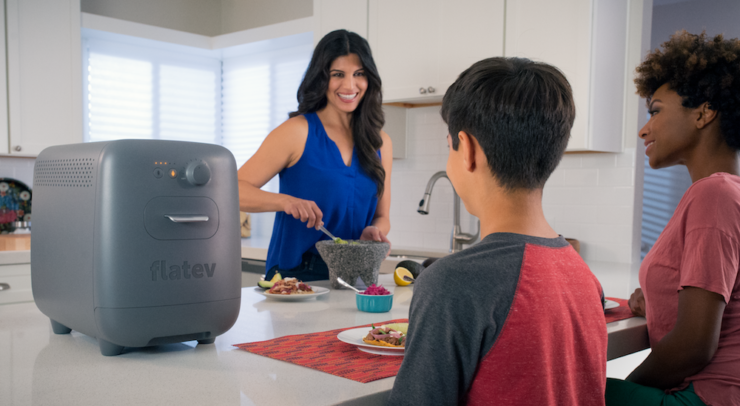 It’s an appliance that uses dough pods to produce fresh tortillas, it’s the Flatev. It’s a simple concept, but suffers from an unreasonable design, high price, continuous cost and poor concept. Let’s start with that, the concept, because as appealing as a fresh tortilla sounds, there’s no real benefit as opposed to store-bought tortillas. They may taste a little bit better, but at that point, you might as well make your own. Next, the design. There’s no way around it, it’s a massive appliance. It’s the size of a coffin and sits on your countertop. I don’t know about you, but I have a coffee maker, a toaster oven and a tea kettle on my counter, and that’s it. This thing is way too food-specific to justify leaving on your counter, which means it’ll soon be sentenced to the cabinet of untouched appliances. Third is price, the lowest Kickstarter-tier it came in was around $199, which is hilarious. Afterwards, you have to buy proprietary dough-pods which, who knows what they cost. Oh, and they’ll go bad if you don’t use them. I could talk about this thing forever, but I’ll spare you the essay. Overall, the Kickstarter page looked proper, the mock-ups, videos, and photos are all elements of a great Kickstarter, but it’s kind of a useless idea to begin with. And on top of that, the Kickstarter made nearly 3x its goal and is already 2 months behind release with no end in sight.